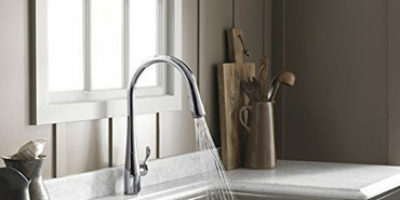 Kraus is a well-known faucet manufacturer. The KPF-2620SS model is a true state of the art piece of equipment if you like a modern kitchen faucet with classic functions. 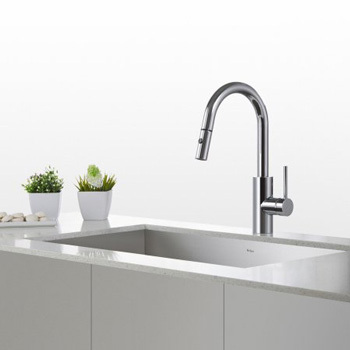 The Kraus KPF-2620SS Mateo Pull-Down Kitchen Faucet is another faucet without a sensor but still an impressive part of the kitchen. It has a 360-degree movable spray head that’s excellent for cleaning up the sink and the kitchen in general. The hose that is pulled down from the spout is 36 inches which is pretty much enough for everything you’ll need to do inside the sink. Washing the dishes and cleaning up the sink won’t be a problem with the hose and the spray head that rotates. Being made of steel combined with brass, we can say that the KPF-2620SS is very durable, yet it looks very impressive. Mounting it is very simple and with the 4-step QuickDock system, the user won’t have any trouble with this part. It can be mounted on both one or three holes, depending on the needs of the user. After it is mounted, the arc of the spout reaches 8.6 inches which is something that some might find not enough, but really it is enough for most things you’ll have to do in the sink. The water flow is controlled through one handle. With it, the user controls the water flow, the temperature and through the button, on the spray head, the type of the spray is adjusted. The spray head is a masterpiece on its own. Kraus is using Kerox ceramic cartridge that together with the aerator and the silicon nozzles creates an anti-clogging system preventing the nozzle get stuck with unwanted particles over time. Also, the Neopearl aerator technology allows the user to save water and use the water stream for certain cleanups without the need for a strong water jet. 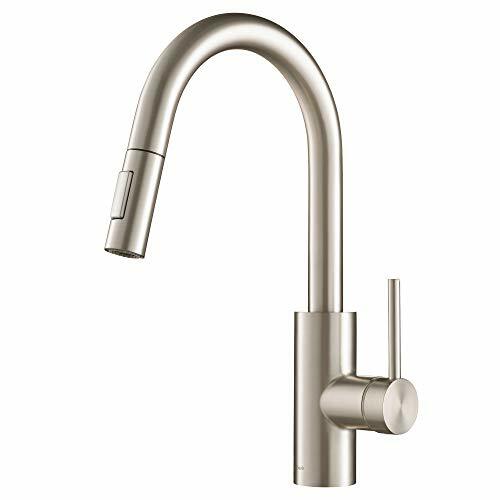 The Kraus KPF-2620SS Mateo Pull-Down Kitchen Faucet is made of metal and brass. The finishing is made to be resistant to corrosion and the look is some fine rust-resistant silver color. It really looks classy and will certainly fit into any decor and any kitchen style. The spout reaches around 8.75 inches from the bottom of the cabinet. That might not be a height that some are looking for, and there are faucets on the market with a much greater number than this, but overall it is not bad at all. Some prefer lower arc because the water is not splashing too much in the sink. If you had problems with this in the past, then you’ll love this model. With 36 inches, the hose that is fixed to the end of the spout it’s completely enough to clean everything in and around the sink. If the arc was taller than the hose will be too small, but this way it’s really enough for everything. The best thing about it is the special Kerox system that prevents the corrosion and dirt to stick with the nozzle. Together with the anti-corrosion and stainless finishing, the faucet will always look clean and shiny. There’s one handle that regulates everything and is having the same finishing as the rest of it. 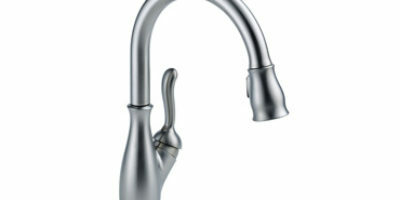 It fits perfectly with the rest of the faucet and is really easy to work with. It follows the same line as the spout, and it looks like very modern. By pushing it you regulate the temperature and the flow.